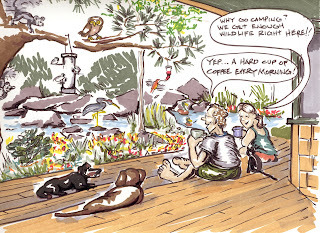 This was on our '03 calendar, and I like this toon because it captures the essence of living at our house. It is very easy to just stay home!! We have nature running past our doorstep at about 100-800 cubic feet per second!! The river running past our house adds soooo much wildlife, and entertainment. When it is warm enough, our favorite thing is having that cup of coffee sitting on our deck watching the birds, river, dogs, cat,and anything else that wanders by. Plus, Chris has done such an amazing job landscaping our house that it is fun to watch what flowers are blooming, and what vegetables are getting ready to pick. I absolutely love where I live, and I think this toon really nails that. 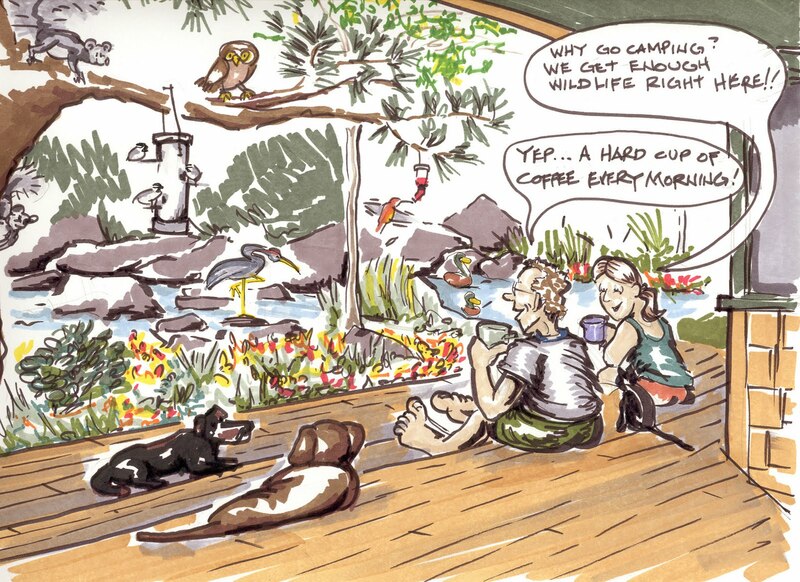 Even though the dogs in the drawing look a little wierd, you can still tell that they are relaxed and happy lying on the deck. Everything about the drawing reinforces a relaxed enjoyment of nature. That is what our house is all about! The view from the deck is a little whiter out there today!